Powerful flexible adhesive that is odorless and solvent free. The adhesive is in a ready for use, paste form. Its special formula reduces impact related noises. It is moisture and age resistant. It provides strong adhesion to absorbent or else, stable substrates even without primer, providing the substarte is sound. It maintains its original flexibility, thus ensuring the unbreakable bonding on floors that are subjected to vibrations and the effects of expansion/contraction. Suitable for bonding all types of hardwood floors on concrete, mosaic and ceramic tiles, marble as well as primed or galvanized sheet metal and MDF. 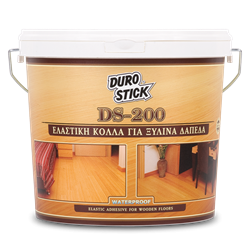 Suitable for bonding wood skirting boards and large wood planks of varying hardnesses. It is recommended for use with radiant heating systems. Classified D3/D4 per EN 204/205. 0.7-0.9kg/m² when applied using a B3 or a B6 notched trowel. The consumption depends on the substrate and the type of the wood floor. For bonding long or wide planks or to bond on uneven substrates, use a trowel with bigger notches.